Write down and communicate your goals and objectives, and plan for continued success! Once written down and communicated, you will then be in the best position to make operational decisions based on what you’ve already outlined in your goals and objectives list. Once completed, the likelihood is that you will never look at it again. It will be locked away in a draw and, to be honest, it is of absolutely no use to you whatsoever. It’s out of date as soon as it’s completed. So what does work and why should you plan? “Unless commitment is made, there are only promises and hopes; but no plans.” A business plan is a tool to aid decision making, it should be a living document that works for you, that is continuously reviewed in light of the business environment and actual performance. The strategic planning process is a valuable and exciting exercise that can be a major contributor to team building and a means of developing ownership/commitment to the plan. Involve people because it should end up as ‘our plan’ not ‘their plan imposed on us’. I work with a three step process beginning with a ‘goals wheel’ culminating with a ‘living’ plan that assists with commitment and continued accountability. Explore your vision for the future of the business. Take the time to reflect and think of what you aspire to for your life and business in the future. This is the time to be creative, thinking ‘without boundaries’ and exploring exciting opportunities three to five years in advance. Consider your business and the goals you have for the growth/exit for the business. List anything and everything you could possibly want; go on, be brave and dream big! Strategically plan all aspects of your Goals Wheel, listing all the attributes and targets you believe the business must have in order for you to reach your personal and business goals and aspirations. Ensure all targets and goals are S.M.A.R.T. Clarity of the goals and targets you have set. Confidence that you have the knowledge skills and competencies to achieve these goals. Motivation to get out of bed and achieve. Accountability ensuring commitment to carry out your plans. You will have done a lot of work to get this far, understanding your vision and goals with a strategic plan is a great start. This is when the hard work really begins. You will work tirelessly on your plan and realise that along the way adjustments need to be made and occasionally ideas and goals totally change. I always encourage continuous review and 90 day planning meetings to plan, implement, reflect, review and improve for continued success. Some fascinating studies have demonstrated that proper planning can help companies grow at least 30% faster. One study, published in 2010, aggregated research on the business growth of 11,046 companies and found that planning improved business performance. The answer (most likely) lies in the fact that existing businesses know a bit more about their customers and what their needs are than a new start-up does. For an existing business, planning involves fewer guesses or assumptions that need to be proven, so the strategies they develop are based on more information. Another study found that companies that properly plan grow 30% faster than those that don’t plan. This study found that plenty of businesses can find success without planning, but that businesses with a plan grew faster and were more successful than those that didn’t plan. To reinforce the connection between planning and fast growth, yet another study (last one for today!) found that fast-growing companies that had over 92% growth in sales from one year to the next usually have business plans. They create budgets, set sales goals, and document their marketing and sales strategies so my call to action this week is for you to take some time to work on your business to set goals and build a plan for your future. 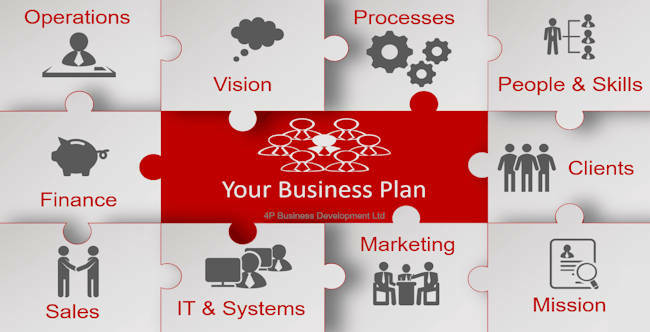 More importantly, re-visit your plan as you grow and revise it as you learn more about your business and your customers. And if you’d like a coach to keep you on track, why not call me on 01280 700405 or click here to send me an email enquiry and let’s have a conversation about your goals and objectives to see how I can help you. PS: The study information in my blog post this week was provided by the Journal of Management Studies. 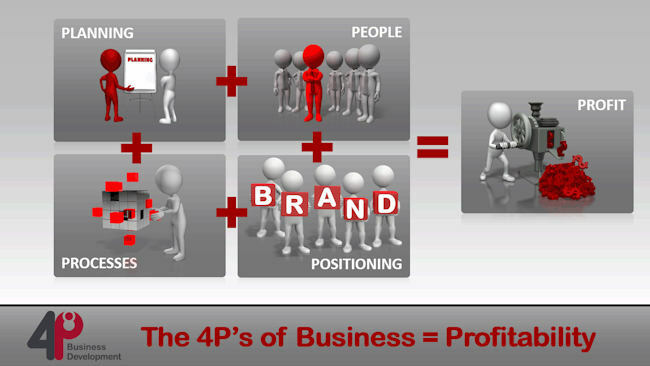 The 4P’s Of Business need goals and objectives to make them work! And that’s never more important than when that business is owned by you. So let me ask a couple of easy questions. Firstly, when did you last actually take the time out of the day job to focus on your end goals for both your business and your personal life? And, just as importantly, are the two concurrent or are they miles apart in respect of timescales and financial requirements? I ask the bloody difficult questions, and then support, encourage and guide you to set those goals, to achieve your aspirations and realise your true potential by holding you accountable. Once you’ve set your goals and objectives, there are 4P’s that must be developed to get you there. These are planning, people, processes and position. Have you written down and communicated your goals? When you have written goals and objectives in place, you will find that you are able to spend time managing your business. You will then be in the position to make operational decisions based on what you’ve already outlined in your goals and objectives list. Do you have the right people in your business? Too many managers employ people to match the job role that is currently in place. However, great managers seek the employee with the style and type that suits their business culture, whose skills and talent can redefine how that job is carried out, adding productivity and profitability to the bottom line. How efficient is your business? How many tasks could be streamlined or carried out in a more efficient manner? You’ll be surprised at what I discover! I will scrutinise your business processes to identify how and where they can be streamlined, whether process order can be improved, if existing tools can be better utilised, and where investment in new systems or equipment can be justified. When did your last review your marketing activity, PR, customer experience, client retention and position in your market? Marketing can be defined as the intermediary function between product development and sales. It is the marketing professional’s job to create, manage and enhance brands. Get the 4P’s working together and you will realise productivity and profitability which will move you closer and closer to your goals and objectives for your business and life! “Business efficiency is crucial to business success, but what is often underestimated is the importance of business owner efficiency, and having a founder who can demonstrate consistency and speed in things like planning, time management and decision-making from day one. My thoughts exactly! And if that resonates with you too, and you’d like to explore working together to set your goals and objectives, optimise your planning, people, processes and position and achieve productivity and profitability then I’d love to talk to you. You can learn if working together would be a great idea by calling me on 01280 700405 or you can click here to send me an email enquiry, let’s start a conversation and we can find out. PS: If you’re looking for a partner to help grow your business, visit www.4pbusinessdevelopment.co.uk to discover how 4P Business Development can help you!